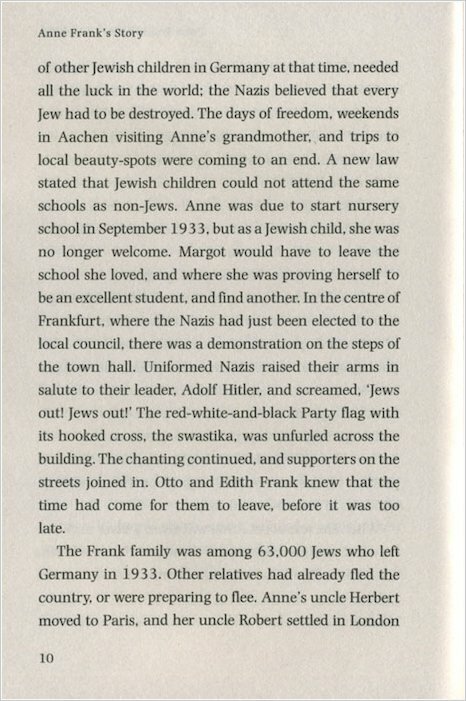 A simple and moving account of the life of Anne Frank, the young girl who evaded the Nazis for two years before finally dying in Bergen-Belsen. This biography journeys from her happy early childhood in Frankfurt to her youth in Amsterdam, and from her years in hiding to the final months of her life in the concentration camps. It answers your questions about Anne’s life, and includes memories from her surviving friends, a historical note and a map. Read it along with Anne Frank’s diary to explore a young life cut short by war. I love this book so much I think the book is very sad but also really interesting. This is an amazing diary!! I read the first two pages and I’m already upset. A girl like Anne did’nt deserve to die Who would have to spend the last days of their lifes hiding from Adolf Hitler’s team of Nasis…? A really nice story, very emotional. I feel so sad whenever anyone mentions her name. She was only 15 when she died!! I wouldn’t survive a day in hiding – not enough books and….. NO TALKING! 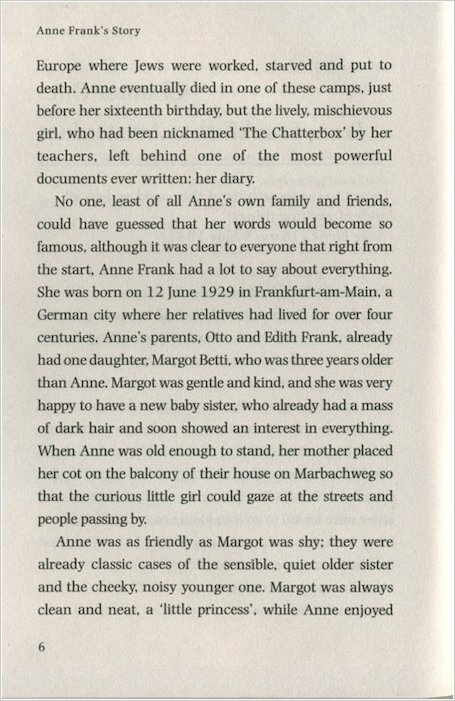 Anne Frank is a wonderful role model and I read her diary so I really liked this book. Love history and looking for something to read? Well if your answer was yes this is definitely for you! Very touching and a great insight into one of the greatest person’s lives during the holocaust. A brilliant story but very sad. She was a very brave girl. I loved the story, I wish I had known her.She is an amazing person.The wrong people die. It was a great book. And i almost felt as if i was her. This book is good, but reading Anne’s own diary gives a much better, clearer picture of what happened. Anne was and is an inspiration, and this helps to simplify her story for children. A great book!!! Sad but truly amazing!! 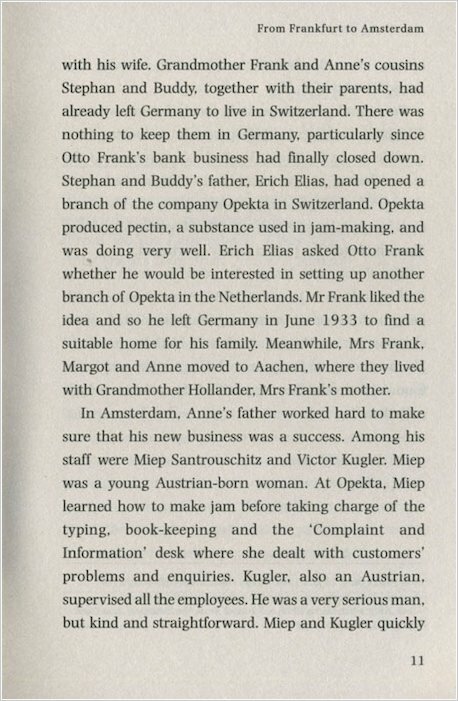 I’ve read Anne’s Original diary edited by his dad Otto H. Frank. 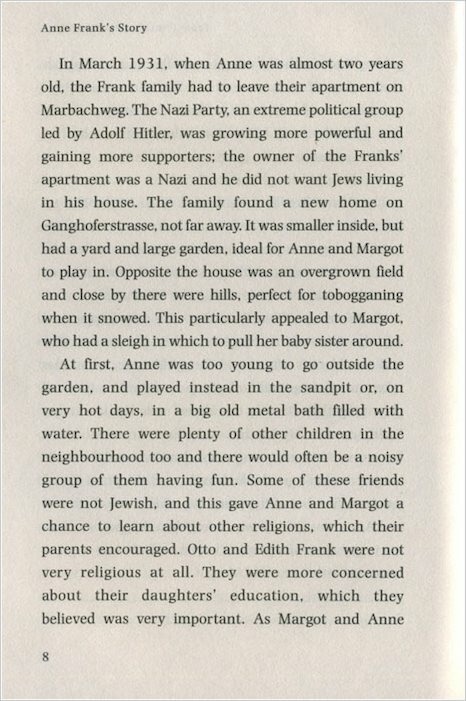 Her diary was completely appealing and also very sad at the end because Anne and her sister Margot had to go to a concentration camp where they both die…. but still i really love this book!!! So upsetting and emotional. 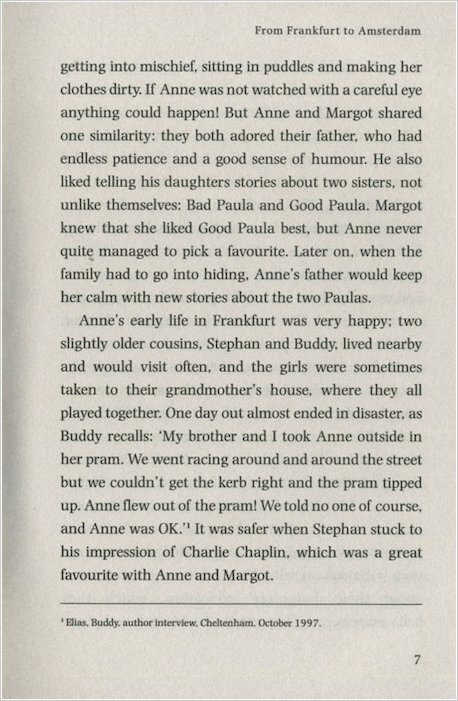 I cry when thinking about the horrid things that happened to Anne and her family. Just shows how lucky we are today. So detailed, her diary is. Please read it. Understand how lucky we are. Show respect to Anne frank and her family. So moving. 5/5 stars. I have read this book about 3-4 times but it still keeps me contended. There are some parts which made me feel crestfallen but there were also some joyful times. This book was an excellent read. I would really recommend this to every single person I know! i give this book a five out of five because i found it truly sad and heartbreaking. it is one of my favorite books and i hope you find that too. i recommend this book to any young historians. The book is really heart warming and is sad at certain points but is truly amazing! Very sad but informative true story about a young girl going through the hardships of World War 2. Very interesting. This is so wonderfully heart warming but also extremely sad. It’s brilliant though. it is very said at the end when annie frank died, but it is very exsiting she’s hiding in the secret attic! I loved this book because it was really really detailed and very informative. This book is simple, but moving adnd emotional. I can almost hear her voice, I loved this equally to her diary. Her story is very heart warming story. i read this book in school it is sad but a good read. I think this is one of the best books I have ever read!!!! It is all about a girl living in a attic during the second world war!!! this book was great and moving. 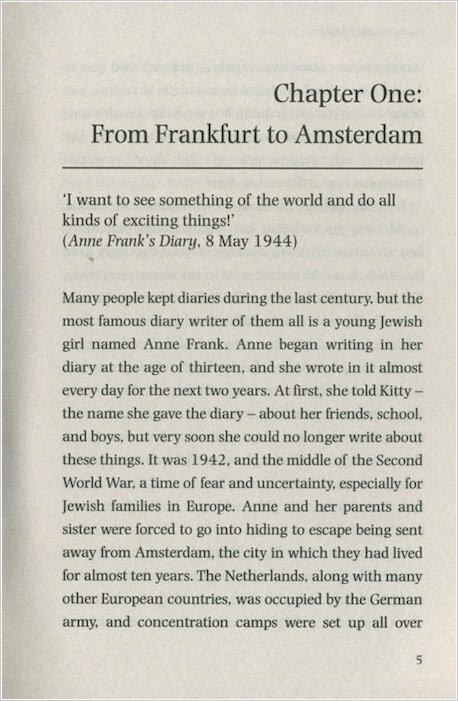 Anne Frank is a powerful, sad story about a real girl who wrote a diary in World War 2. It shows the hardships of her lives, and her little joys. I have read this book on many occasions never get tired of reading it, I think her story gives a great insight to what they had endure during the nazi’s reign of power during the second world war. I JUST SIMPLY LOVE IT – it is an amazing book – I read it in school and it hit me like a ton of bricks – it is so sad and so overwhelming – i would read it again anyday by far – 5 / 5 AMAZING !!!! Well, on the whole, it’s a very interesting book! The way it is re-written for younger children (7-8, perhaps! )relitavely well. However, it’s still quite a sad story! I could only bring myself to read it a few times – maybe no more than 3. That’s why I am rating it 4 stars, and not 5. But anyway, I do recommend it if you understand the situation! I was soo sad i was cring for half an hour when she died! This book I think is scary. It is so scary. I will never read that book again. But it is also very sad I must say. A very emotional story. It clearly retells the sequence in her struggling life. i very much enjoyed it. As you an see ive not rated this book becase i have not read it but it look FAB!!!! 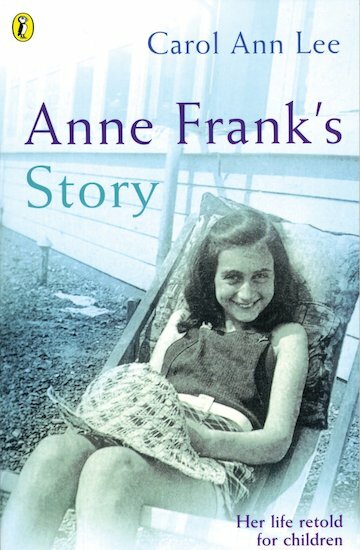 i love this book but it is ver sad, i tried to rea anne franks real diary but it was to hard, so when i found this book i was soo happy because i could understand it and it was really good. it has a eally sad ending but i was glad that everyone got to see her diary! I can’t believe Anne what had to go through! I think Hitler was wrong to do what he did to all the Jewish people! THEY ARE HUMANS SO WHY TREAT THEM LIKE SLAVES?! WOULD YOU LIKE TO BE TREATED LIKE THAT?! DIDN’T THINK SO! I love this book and most of all I love history so if you are like me this book is great for you!!!!! not read it is it awsome? i read it at school in only 15 mins!!!!! i’v red som of dis book and it is sik!!!!! This book really inspired me to learn more about Anne Frank and I have carried on learning about her for years after I read it. I would recommend this book to anyone who is looking to read a real life story in the war time. 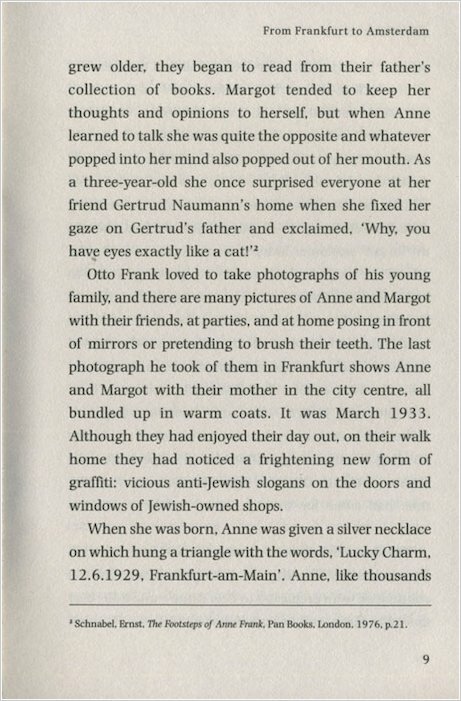 A very touching dairy of a young girl, who is hiding with her family in an annex from nazis in 1930. I have read it a million times because youcan understand and relate to what life was like for Jews. This book is a time to remember all the deeds we have done, good and bad. Referring back to the sad but loving Diary, I learnt a lot and it was very good because her life was retold to me in such a way that it goes wilder than your and my imagination. Rating this a 10/10 I would be accurate to say, this autobiography is one of the best! This book is sad but yet fun. I really like Anne and Margot’S personality. I think I will really enjoy this book when I come to reading it. I have heard about this book so many times and i really want to buy it because i am very into WW2. i have watched this and it was about a girl called Anne Frank, she was a jew and she was hiding because she didn’t want to go to concentration camp and she kept a diary and some Germans came and found them and they went !!!!! She left her diary behind all her family died in the camp but her father survived!!!!!!! 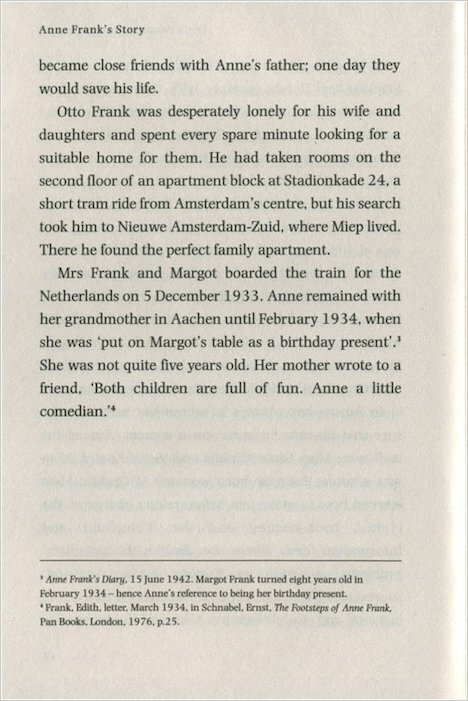 i think the story of Anne Frank is so interesting and cant waite to get it! ive read it at school and loved it 100%! This is the story and diary of Anne Frank, a normal Jewish girl whos life completely turns around when her family goes into hiding. She has to make some tough decisions and begins a brief romance with an older boy from another family who are also in hiding. This story will bring tears to your eyes and make you laugh and keep you on the edge of your seat all at the same time. The Frank family are betrayed by the people who own the attic they are hiding in but Anne’s diary ends before they are betrayed. This story made me appriciate how lucky I am not to be in hiding and to use the freedom I have instead of watching TV all day.